In the short time we've headquartered in Kamio, we have had a devastating impact on our enemies. Non-compliant miners have suffered more than 60 billion isk in damage since our Knights assembled at the beginning of this month. It's time for the forces of civilization to go on the march once again, and liberate a new system. A system at the very heart of botterdom in highsec. That's right, I'm talking about The Forge region. Home to Jita, it's the capital of highsec and EVE itself. 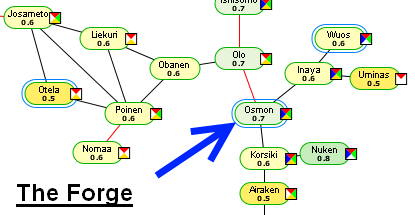 Our focus will be the Osmon system. It's an extremely popular mining destination, and it's home to three ice fields. That's right, you can clear Concord out of an ice field by suicide ganking miners in another ice field. Osmon is also two jumps from Wuos, a system with two ice fields. Just west of Osmon is a cluster of popular ore-mining systems with 0.6 security. You can also see Otela, an ice-mining system only three jumps from Jita (its 0.5 security makes it much less popular than one might otherwise expect). Ordinarily I might organize a bumper fleet, schedule it for a particular date and time, and announce our move only at the last moment. However, given the logistical needs of our Knights, I decided to announce our move in advance, publicly, and with a less-definitive timeframe. I would like to see the Osmon system get seeded with Catalysts and gank gear this weekend. If you need someone to move large volumes of stuff, you can hire Red Frog Freight. I have used them before, and it's easy. On their website, simply enter the pick-up and delivery systems. They'll calculate the cost of transport and tell you how to set up a courier contract to them. After you create the contract, your stuff should be moved within a few days. Risk is minimal, since you can set collateral at 1 billion isk. Push Industries provides the same service, though I haven't tried them yet. It's also time to begin using New Order Logistics, the corporation of my ganker alt, Currin Trading. If you have participated in a number of ganks for the New Order, you may apply to join New Order Logistics. It has 200 membership slots, which is more than I suspect we'll need for a long time to come. Any member of New Order Logistics can then buy their stuff at market value through the available corp contracts. Only one member of a gank gang would need to be a member of New Order Logistics, since they can buy a "pack" and then get reimbursed/trade the stuff to the other gang members. Putting it all together, it's possible for anyone to seed the market of our headquarters, either on the free market or with corp contracts. With public courier services, it's not even necessary to have your own freighter. This is a useful test for the future. If we're able to set up stockpiles in various systems, our Knights can move freely around highsec in their pods, grab ships, and strike without warning in a wide variety of locations. Once we can do that, it's pretty much game over for anyone who opposes the Code. Even what little resistance we've seen thus far is dependent upon our being predictable and operating in the same place all the time. Having access to a stash of ships/gear removes the last obstacle to our mobility. For example, if we have a big stash in Osmon and a smaller stash in Wuos, our enemies can't even camp gates. With enough stocked systems, the miners themselves can't easily avoid us by relocating to a different system. The only way to avoid destruction in highsec will be to follow the Code. As we all agree, that's the way it should be. I believe I will relocate tonight and start bumping right away. I went to Kino last night as I figured no one had been bumping there for a while. Both ice fields were full of stationary Macks and Retrievers. Once I had given them the spiel local lit up with enough invective and defiance to fill 10 Miner Bingo cards. Kamio has been so subdued by the Knights that I had forgotten how angry the miners get when they don't yet know the score. I got threatened, in game and out, carebear stared for hours, space lawyered and I know I was petitioned by at least three of them. And one put a 50,000,000 ISK bounty on me more than doubling my previous amount. Bumping these miners was trivially easy. The two I selected as my new friends did not complete more than a couple cycles before giving up. They tried orbiting, approaching, cross field warping, insulting me in local, even had some counter bumpers. Nothing worked for them as they were easy to smack into empty space. Was thoroughly enjoyable. I look forward to Osmon. Push Industries are pretty good, they have a lot of smaller haulers running around so small loads are moved fast. I've used both in the past and will happily use either. I'll look forward to the help up here in Otela, it's lonely. It is! It IS the way it should be!!! Aww, please let it be Brapelille next time. It's 5 hops from Dodixie and it is crowded ! I started bumping there at first but bumping alone is much less fun. Another bumper that started in Brapelille! I'd be glad to return, I know a few code-compliant miners there that would welcome our presence. I'm always near Jel and Brap and Atrion when I go into Egg for small gang roams. I always try to stop by the ice in brap to say hi. Otela is rampant wil afk's and bots. On a good note, we've already got a permit sold in Osman to a DAN MAKKEN! WELCOME TO THE ORDER DAN! My guess is we'll get more compliance in the Forge, if perhaps fewer real converts. The Forge is where you make money from trade. To do that you must be physically present in the Forge, but with modest skill can be 10 or 20 jumps out and trade just as well as being in Jita station. So, rather than sitting in Jita doing nothing other than watching the market, you might as well sit at an ice field doing next to nothing while watching the market, and also make some money. I expect there are a lot of ice miners in the Forge who are doing this. They are at the keyboard but not paying more than marginal attention to their barge. That is why I predict more compliance: these guys, generally, understand opportunity cost. Also, they'll have less attitude about being a "proud miner" -- they are not miners, they are traders. Mining is a minor sideline; being a miner is nothing to them. By the same token, though, we'll be getting more alphaliam-like attitude, namely, that they are buying a service as a customer, and not that they are bending their necks to a sovereign. Also, we probably won't get as many pods. True AFK miners are podded almost trivially, as our stats show. But ATKNPA (at the keyboard not paying attention) miners should hear the gunfire and "woop woop" of imminent death in time to get their pod out. Or they will dock and just not care, like you said mining is a sideline. On our first visit last night, Admiral Root and I found the miners to be aware of the New Order from sporadic prior visits by Agents but not too concerned. Most were not orbiting and several were clearly afk and never returned to mining after being bumped. They were generally less hostile than the miners of Kamio and especially Kino. Perhaps it was just the particular ones there last night. There were a few who tried to defy us in local and several space lawyers. None of the white hot, brain melting rage I saw in Kino a couple days ago. I don't think they expected us to be able to bump them if they were trying to evade but Admiral Root and I showed them what a trained bumper is capable of. Not surprisingly they didn't voice much concern about the Knights as they don't yet know what that really means. The general advice of the miners in local at least was to ignore us Agents and we would go away. This attitude should survive about one second after the first occurance of a Knight fleet.